Hero Histories: Video Fridays: THE GREEN HORNET vs BATMAN! We've updated this post with corrected video links HERE! 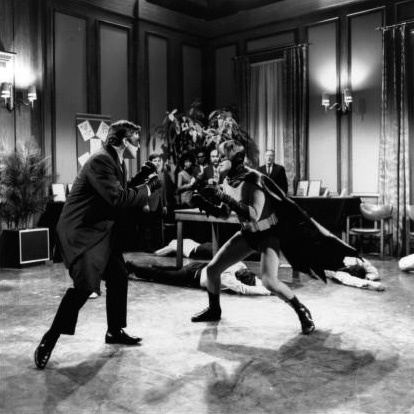 Batman vs The Green Hornet! A decade before Superman vs Spider-Man , this was the first inter-company superhero crossover. The Hornet and Kato had already cameoed on Batman, in the episode "The Spell of Tut", where they appeared in a window during a Bat-Climb. Celebrities ranging from Sammy Davis Jr. to Edward G. Robinson popped up for brief appearances during these sequences. Even characters from other ABC series like Lurch (Ted Cassidy) from the Addams Family and Col. Klink (Werner Klemperer) from Hogan's Heroes showed up! Curiously, the visiting duo are regarded as heroes, not villains, and Britt introduces Kato by name. And, as we've pointed out before, both Batman and The Green Hornet featured their characters watching each others' show on tv! All that was basically ignored when it was decided that, to boost Green Hornet's decent (but not Batman-level) ratings, GH and K would appear as "Visiting Heroes" on Batman. Instead, a new baddie, Colonel Gumm, played by Roger C. Carmel*, was introduced, along with a plotline involving counterfeit stamps which drew The Hornet and Kato to Gotham. The motif of GH and K being perceived as villains was utilized, resulting in the Dynamic Duo being as eager to capture them as to jail the corny counterfeiter! In addition, it's shown that the two heroes' millionaire alter-egos, Bruce Wayne and Britt Reid, have known each other since childhood, and constantly competed over almost everything, including women! Unfortunately, the gambit didn't pay off. The Green Hornet's ratings didn't improve, and the show was cancelled. (Note: the show's ratings were good enough to make them eligible for renewal, but, since the producers didn't want to implement network-demanded budget cuts, the network axed the series anyway. *Roger C. Carmel played numerous flamboyant villains on everything from The Man from U.N.C.L.E. to Hawaii Five-0 to Transformers to Star Trek , where he portrayed Harcourt Fenton "Harry" Mudd on both the classic and animated series! He's also the answer to the trivia question; "Who's the only actor to play a villain opposite Batman, Captain Kirk, and The Green Hornet?"